NASA administrator on "Space Force"
While speaking at a National Space Council meeting at the White House in June, President Trump called for a "space force" to be added as a sixth branch of the military. This week on "The Takeout" CBS News chief White House correspondent Major Garrett spoke with NASA Administrator Jim Bridenstine to explain America's dominance on the last frontier. Bridenstine, a former Navy pilot and former U.S. congressman, served on the Strategic Forces Subcommittee, a branch of the Armed Services Committee that deals with America's space capabilities. He said, "space has become congested, contested and in some cases hostile. And it has become very dangerous." Mr. Trump has also reactivated the National Space Council, which was first established by President George H.W. Bush in 1989 and disbanded in 1993. 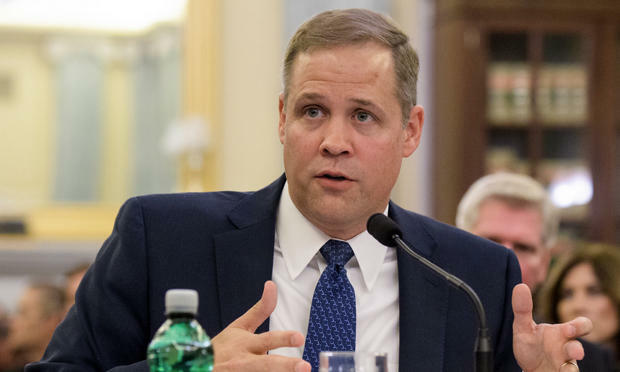 "One of the first things the president did regarding space was recreate the National Space Council which includes a lot of the cabinet members," Bridenstine said. As NASA administrator, Bridenstine serves on that council. "This president has been very aggressive in trying to reestablish America as the preeminent nation in space," he said. Last year the Senate rejected a plan created by the House to implement a "Space Corps." But according to Bridenstine, Mr. Trump "doesn't want a corps, he wants a force. He talks about it as being a separate force, equal in stature than the Air Force." A "space corps," meanwhile, would have been under the umbrella of the Air Force, following the model of the Marine Corps, which acts as a separate military branch but exists within the Navy. Congress has to play a role in creating a separate military branch under a legislative agreement, and funding for the "space force" must be authorized by congress. While NASA is America's civil space agency, it has no involvement in the security aspects of space. Bridenstine's role on the National Space Council makes him particularly interested in funding to improve space security and exploration. "We can't do what we want to do with American taxpayer dollars exclusively...it's too expensive." Bridenstine said. "So we need commercial partners that are willing invest their own money for their own purposes and we need international partners. And I will tell you, there is no shortage of international partners that are willing to go with us to Mars." The "space force" intends to organize, train, and equip people in the interest of space-related national security. It could, eventually, lead missions to other planets, including Mars. "When you think about jamming and dazzling - dazzling is using laser energy to try to confuse or make our satellites not be able to see or hear - jamming, dazzling, spoofing, hacking. All of these things are affecting space in ways that make it very dangerous." According to Bridenstine, countries who are hostile toward America are taking measures to interrupt U.S. technology in space. "Our very way of life is dependent on space. The way we navigate. The way we communicate. Over-the-horizon communications. The way we produce food. The way we produce energy. The way we do disaster relief. In fact, the way we do banking in the United States of America, if we lose the GPS signal, there are no interbank transfers. That means there will be no milk in the grocery store. Our way of life shuts down." For more of Major's conversation with Jim Bridenstine, download "The Takeout" podcast on Apple Podcasts, Google Play, Stitcher, or Spotify. New episodes are available every Friday morning.